Well, just to round out my week in purples I’ve decided to post a comparison photo of some of the dark and/or dusky purples I’ve used in the past several months. 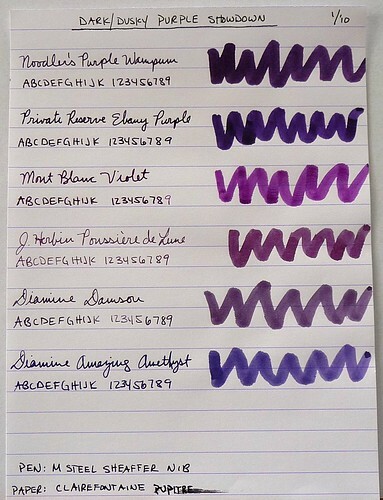 I’m not such a big fan of Noodler’s Purple Wampum. It can be a bit feathery, but the color is great! PR Ebony Purple is my go to purple for when I want something bordering on black, but not black. Mont Blanc Violet has great sentimental value for me. My husband gifted me this ink on our wedding day. I have two bottles of it and only use it on occasion. It is one of the best looking red leaning purples I’ve found. JH Poussiere de Lune is gorgeous and performs flawlessly. I have a love hate relationship with Diamine Damson. I like the color in the right pen, but I find the ink to be a bit dry feeling at times. Diamine Amazing Amethyst is probably my favorite purple right now. It is basically the perfect gray purple that leans blue. There is nothing like it! Try Purple Martin. It surprises me how few reviews I see of that ink. It’s a beautiful color.